This interactive presentation contains the latest oil & gas production data from 13071 horizontal wells in the Permian (Texas & New Mexico) that started producing since 2009/2010, through September 2017. Completeness of recent production data is always an issue in these states. Instead of showing rather incomplete data for October, I thought it would be more enlightening to have another look at the most recent data through September (although I still expect minor upward revisions). Data from the New Mexico side of the Permian is also shown. The graph above reveals that output from horizontal wells has grown at the fastest pace in the history of the Permian. It already crossed the 1.6 million bo/d in September, and has now without doubt passed the high mark of the Eagle Ford in March 2015 at 1.66 million bo/d. In the “Well quality” tab, the production profiles for all these wells are shown . If you compare these profiles to those in the Eagle Ford, you’ll notice something striking: whereas productivity in the Eagle Ford is only up slightly, and mostly in the early months, average well productivity in the Permian has steadily improved in recent years. Crucially, these gains appear not to be limited to the initial phase. The last tab (“Top operators”) shows that the leading 3 operators in the Permian (Pioneer, Concho & EOG) have used these developments to rapidly increase their total output. This “Ultimate recovery” overview shows the average production rate for these wells, while they are heading towards their ultimate recovery. 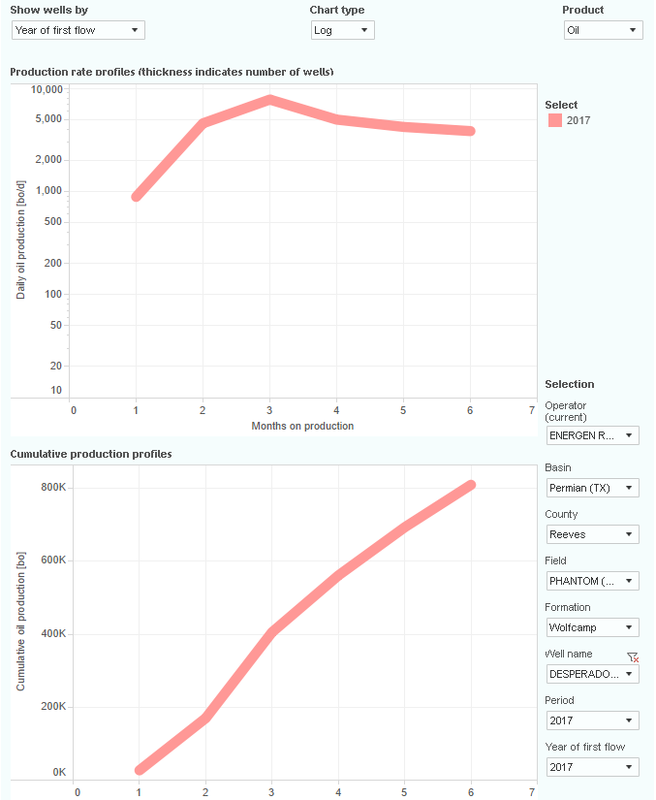 If you follow the curves corresponding with the wells that started early 2016, you’ll notice that with ~150 kbo cumulative production, they have on average already produced more than earlier wells, despite starting later. The 5th tab (“Productivity over time”) shows the average cumulative production over the first 2 years, from wells starting in a certain quarter. In the period from mid 2013 to mid 2015 (the latest for which this metric can be calculated), this amount has doubled from ~70 kbo to over 140 kbo. In the 2nd half of next week, I plan to have a post on the Eagle Ford. Production data is subject to revisions. The latest data for Texas (through October) & New Mexico (through September) has been made available on the Get the Data page. At the request of Jim Brooker, I created an extra overview that visualizes the relationship between what I call ‘ultimate recovery profiles’, and the Gas/Oil ratio. This is temporarily available here. Thanks for the Permian holiday special!-) New data really cleaned up artifacts from the graphs. Recent monster wells show no weakness, but I guess it is still early days. I see this monster #1 well (API#4238935243) that started production in April, 2017 and already achieved over 800 MBO and 2BCF, that means it must be producing close to 6 MBO PD and 15MMCF PD (or 8.5MBOEPD) for the past 5 months. But, we can not see this well’s production profile when try to locate the well by name or API#. That looks a bit extreme indeed. You can find the well if you search for e.g. the API number 4238935243 (see pic below). I suspect a data issue (e.g. there may have been other wells on this lease). I have made a note, and will check this well during the next update in more detail. Be careful with the interpretation of outliers in the data. Unfortunately this may sometimes happen due to incomplete/incorrect data for especially Texas. thanks again for the informations. How complete are the Permian data now? Some time ago, you said that you didn’t have access to a few % of the data. Has that changed in the meantime? > How complete are the Permian data now? Some time ago, you said that you didn’t have access to a few % of the data. > Has that changed in the meantime? That’s a good, but hard question. The reason is that I have the impression that the level of incompleteness has changed over time, and that is has gone up in recent months. I suspect that this has to do with the higher activity levels. An indication of how incomplete the data is can be seen in the “Well status” tab. You’ll notice that the number of new wells hasn’t increased so much in recent months. I belief that this is incorrect, and that information about these missing wells, including their production history, is still in process by the responsible agencies. To put a number on it, I estimate that production data for the last available month shown here (September), will still be revised upwards with 5-10%. yes, I notice that with each new report, the monthly well numbers are getting adjusted. Even 2016 monthly well numbers may still show small changes. The more recent the wells, the bigger the changes in the monthly well numbers, suggesting that the latest well numbers may be 10% too low. But besides that, is there a sub part of horizontal wells in the Permian that is systematically not included in your data? I yes what % could that be? In the past I left out about 10% of Texas Permian hz wells (they were located on leases with many wells), but since an algorithm change made in August 2017 all hz wells that are reported by the RRC are now included. I’d like to put the data in relation with EIA data. Therefore, I need to know if the data are based on the same well basis. Have your numbers been retroactively adjusted for the time before August 2017? That is correct, in my updates since September on the Permian, all horizontal wells that are reported by the RRC (since 2009/2010) are published here. Note that it is always tricky to compare my data with the EIA, as the EIA doesn’t distinguish between horizontal/vertical wells (they also include conventional wells), and uses slightly different basin boundaries as I do. indeed, the EIA doesn’t distinguish between well types, but I think that HZ well completions are highly correlated to your months of first flow, with an average lag of one month or so for first flows. So, from months of first flow numbers, EIA’s HZ completion numbers could be approximated. Can you estimated the impact of the different basin boundaries % wise? Are you aggregating pre peak months of first flow sometimes? I wasn’t aware that the EIA now reports the # of HZ completions as well. For county comparisons, I recommend to have a look at the first overview (“Where”) in the first presentation, and compare this with the county boundaries the EIA is using. > Are you aggregating pre peak months of first flow sometimes? To determine the (calendar) month of first flow, I always use the moment the well has reported oil or gas production for the first time. If you extrapolate the EURs, it looks like you get to EURs in the 400-500k range. If you assume ~65% of total well production is oil, you get to EURs in the 600-750k boe range. Looks like most operators in the public investor presentations are talking about EURs >1m boe. Do you have any thoughts on this discrepancy? Are public operators more efficient than private ones? Is this a pretty standard example of E&P optimism? When you extrapolate EURs, it’s always important to be clear about which cut-off rate you use. My graphs extend to 10 bo/d (or 100 Mcf/d), but the terminal rate you may wish to use can of course be higher or lower. This can have quite a large effect on these EURs. For economic analysis, my recommendation is to figure out the profitable part of the EUR, and other factors not shown here (e.g. price) are important for this as well. An important reason that I started this website was that I saw numbers in many places (reports, blogs, etc) that did not fit the reality (both to the upside, and the downside). My goal is to provide ever more transparency in the shale oil & gas world, so that it becomes easy to see what is true. Stay tuned! > Is this a pretty standard example of E&P optimism? I do think you find a high level of optimism indeed. Many of the companies in this space are regularly looking for outside cash (e.g. financing, or land sales), and therefore for both company as well as individual success, presenting a positive picture is important. In that regard, it’s probably not much different from other businesses that require ongoing investments. Brendan, I actually believe economic limits are reached at 15-18 BOPD in EUR decline curve analysis, depending on oil to water ratios, and say, $50 oil prices, and as you point out most type curve EUR’s used to book reserves could be exaggerated by a factor of 2. I would suggest private companies are more efficient than public companies because, perhaps, they’re more interested in profit than reserve growth and generally speaking have not gotten themselves in dire straits with massive amounts of debt. But both entities lie about accounting methods used to show profitability when there is none, about breakeven prices, about EUR’s, and a host of other things to create false “optimism.” With respect to my friend, Enno; most business models may require outside capital to get up and running and ultimately become self sufficient and profitable. Those companies quickly like to pay down start up capital then, with the help of revolving lines of credit, grow their business from net cash flow. Their PPE appreciates over time and they don’t require, or want ongoing outside investment. No so with the shale industry who’s assets depreciate the day they are put on production. It is replacing reserves as fast as they are depleting, almost, and because wells take a long time to pay out, and are marginally profitable, if at all, the shale industry must rely heavily on other peoples money, or credit to exist. Many get deeper in debt, a large part of their revenue pays interest on that debt, and short of $100 oil, sustained, are going to have trouble ever paying that debt back. The shale business model is very different than other business models, even in the oil industry itself. Many of the wells the shale industry manufactured eight years ago, using borrowed money, that are now making less than 25 BOPD, have not been paid for yet. I don’t think they do or I haven’t noticed it. But if the difference in field boundaries between EIA data and your data is small, your data would for example permit to segregate the EIA completion data in HZ and non HZ well completions, supposing a strong correlation between HZ completions and first flows. I am not sure to be able to quantify the boundary difference between your data and EIA data with regard to well counts. What’s your best guess? Close to 1%? Close to 5%? I try to be cautious with comparing my data here with others, due to differences in methodology. I do expect it to be small, as we both of course cover all the core areas. My advice is to perform such an analysis using the detailed well location data available here. You’re welcome Brian. I just put up a new post on the latest Permian data, so you may be interested in that. If you would like to get an email whenever I have a new post, you can subscribe here.